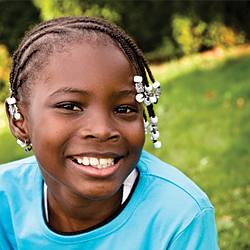 Katie is a 12 year old African-American female who came to Place of Hope due to neglect and substance abuse. This is the third time she has been in care. Katie and her siblings had a traumatic childhood as they were often forced to steal or beg for food and sporadically lived on the streets when they were placed back with their parents. Katie came to live with Place of Hope with her siblings in March of 2008. Since being at Place of Hope, she has taken advantage of every possible opportunity to become a normal kid. She has been such an encouragement and example to so many youth at Place of Hope. Katie recently chose to get baptized and has been eagerly involving herself in activities at church. She volunteers in the kids’ ministry at Christ Fellowship Church every other Saturday. Katie also joined a Bible study group that meets every Wednesday night. It has been inspiring to see how much Katie has grown spiritually and her desire to live out her faith just because she was chosen.